At least 100 patients surround us in the dimly lit hospital waiting room. Sitting on hard wooden benches probably once used as church pews, the two young boys in our care are certainly something to see. Waiting Africans look at them with disgust and horror. Shudders mix with a few compassionate looks. Across from me, a woman with sad eyes tries to make eye contact, and finally does. "What happened?" she asks simply. Before I can speak, the boy's mother replies, "He scratch the eye." The gross misunderstanding makes me sigh audibly. Those four words so telling, so representative of the many things gone wrong in this place. The boys, Clinton and Korle, have only two good eyes between them. The other two ooze red and pink with pus - almost as large as tennis balls. Looking around to meet some of the gazes the boys attract, I realize how much perspective I've lost. These points and stares are now an important litmus test for me at how grotesque these two children seem to most. Yet their bad eyes do truly look ready to burst at any moment. Clinton's mother looks away so I answer the woman's question softly. "The boys have Burkitt's lymphoma. It's a very fast growing cancer. They will get chemotherapy here and either get better or die." Clinton's mom says he's six years old although I'd swear he's at least nine or ten. It's not uncommon here that age is a thing subjective and often unknown - given less importance in a culture that doesn't have a meaning for the word future. I met Clinton last month at our patient screening in Ganta - a one-hour helicopter ride north of Liberia's capital, Monrovia. I photographed him as our pathologist stuck a needle in his eye not once but twice, thus determining he had Burkitt's. When I learned he was scheduled to visit the ship, I happily titled the picture of him wecanhelp.jpg and saved it on my desktop. Whether that title proves true remains to be seen. Clinton first got sick some time last year. His mother thinks July, but it would be extraordinary if he'd survived the cancer that long. She's very thin and pretty and says she's only 18. She looks 22 or 23 and must be or else the math doesn't work. Clinton looks perpetually sad, he is understandably morose. His whole face seems to droop with his left eye yet when he saw me this morning the right eye lit up briefly and an exclamation reached his lips. Barely a second later though, that light was gone. His mother is too rough with him. Both in the way she handles him and verbally. I'm not sure if she blames him for this trek across the country - or for scratching his eye - or for the unwanted looks of wonderment and questions asked. She is pleasant with me though, smiling often, speaking a version of English difficult for me to understand. Korle is smaller than Clinton and frail. I'm told he is six and I believe it. He's had Burkitt's since August of last year, and it's in a late stage. I first saw him at our Monrovia patient screening - he was processed in the long line of eye patients until he was directed to our oncologist who diagnosed him. Korle looks hopeful, yet seems always on the brink of tears. His face shows a curious mix of emotions. He looks at me with a soft expectance, yet I can't tell what it is he expects, or what's going through his mind. He screws his face together as if ready to sob, then composes himself and throws quizzical looks. His hands and arms are always busy. Grabbing the bench. Grabbing and picking at his hair - flicking his fingers together with brisk restless energy. The eye wound drips, I think he hasn't noticed and then an active hand catches the drop before moving on to scratch his head. When I picked him up at his house, a ramshackle hut not far from the hospital, I met his uncle Prince who would accompany us. In the car I learned his name was pronounced KWAY-LO. Prince is a jovial man, about 35. He is gentle with Korle. 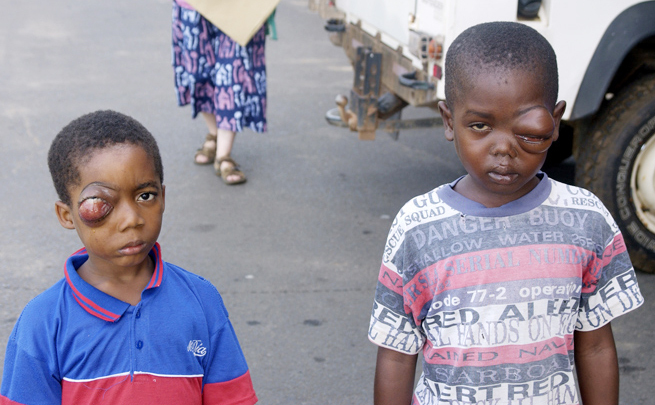 He tells me that when the boy's eye first started swelling, he carried him to the Mamba Point clinic. 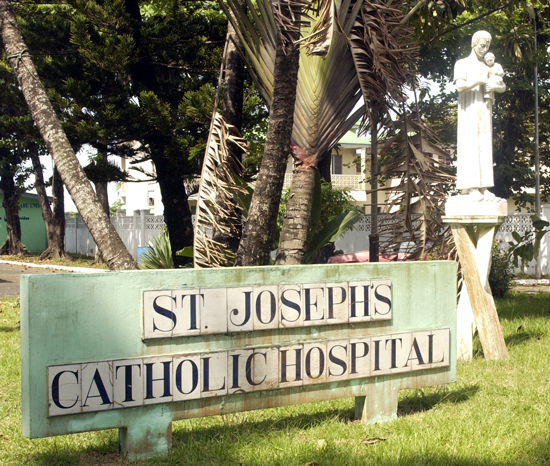 Then to St. Joseph's, where doctors initially wanted to surgically remove the eye. Then to an eye clinic in Sinkor. After yet another dead end, Korleâ€™s family decided to try traditional medicine - hot water presses. They made no difference, and as the eye continued to swell and ooze, a final hospital, JFK, was consulted. Doctors there properly diagnosed the cancer but were unable to treat him. Prince says, "There was nothing else we could do." Yet soon after, Prince heard in town, on the radio and in the papers, that a ship was coming. A ship that provided free surgeries. Free healthcare. 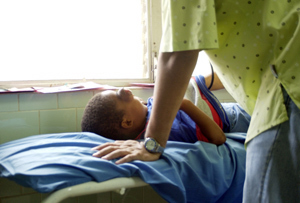 Prince took Korle to the Mercy Ships patient screening and waited. Burkitt's Lymphoma, truly one of the fastest growing cancers known, bears the name of its discoverer, Denis Burkitt, who stumbled across it in 1964. It seems a strange irony that Mr. Burkitt had only one good eye, losing the other as a child in a fight. Yet he desperately aspired to be a surgeon. Not finding a great demand for one-eyed surgeons, his applications to the medical field were systematically rejected until Adolf Hitler's assault on the world opened the door. Even monocular Army physicians were desperately needed now, and in 1935 Burkitt was posted to Kenya and Somalia, achieving the rank of major. In 1946, having proved his cyclopic ability, he stood ready for colonial service and began his work in Uganda. In 1957, Burkitt examined a five-year-old boy there with tumors of the head and neck. A few weeks later he saw the same tumors manifested in a small girl. The tumors grew quickly, and both children died within a few weeks. Burkitt realized what he was seeing could be far-reaching, so he began contacting African hospitals and gathering data. The study took him on the road with two associates, traveling an astonishing 10,000 miles across the vast continent. Visiting more than 60 hospitals in both the east and south, he found himself often in the footsteps of the great explorer David Livingstone. With geographical data assembled, Burkitt was able to deduce that the disease related directly to the mosquito-ridden equatorial region where malaria and yellow fever abound. Immune systems weakened by the bug-carried diseases opened the door to the lymphoma that would bear his name. A later collaboration with Michael Anthony Epstein in 1961 found that the syndrome was also associated with the Epstein-Barr virus. Burkitt began to work on treatments, and was instrumental in devising the treatment the boys will receive. There are two ways to treat Clinton and Korle. A toxic cocktail of drugs used in the West costing upward of $3,000 a child, or the cheaper drug cyclophosphomide - an intravenously administered chemotherapy - the drug Burkitt had success with - about $300 for treatment. 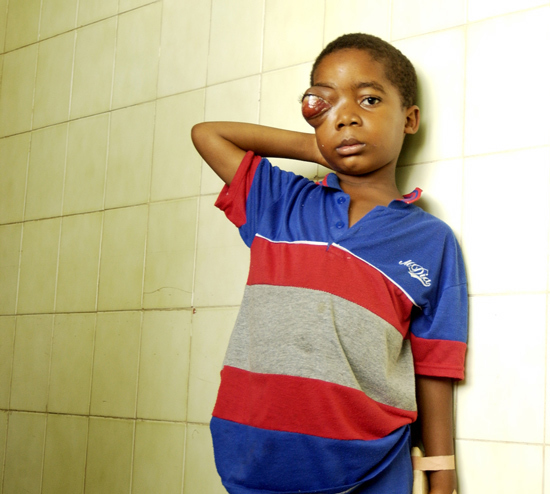 As Mercy Ships specializes in providing life-changing surgeries, primarily maxillo-facial surgery, there was simply no official protocol to respond to the Burkitt's cases observed at patient screenings. However, Mercy Ships oncologist John Jensen, well studied in the epidemiology of the lymphoma, improvised, and decided to take the patients' cause to the crew of the Anastasis. Through an offering, the shipâ€™s crew raised $1977.23 for the purchase of cyclophosphomide. 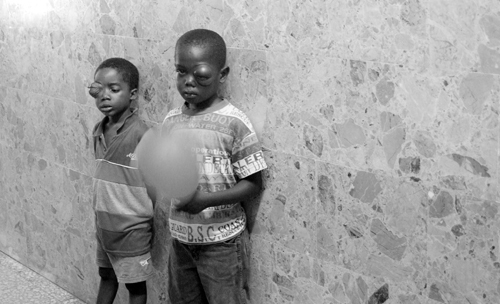 Dr. Jensen liaised with the local hospital, St. Joseph's to treat the cases we discovered and administer the drugs. I'd been told more than once by reliable sources on the ship that I wouldn't believe how civilized St. Joseph's hospital is. A Catholic-run operation in the heart of Monrovia, "It's the nicest hospital I've seen in West Africa," Dr. Jensen told me. Driving a white Land Rover through guarded gates, I see that it boasts a tranquil courtyard and well maintained tennis court. To the side, an enormous tree shades a statue of St. Joseph cradling a child. Once inside however, it is only when held up to West African standards that the hospital retains its dignity. Wires without fixtures pop from walls with cracked paint. Doctor's names have been printed hastily on cards, laminated and temporarily taped outside consulting room doors. A wall of numbered milk carton faces stare at us. "We are missing our children," the wall reads. Two women from the Anastasis sit in the waiting room with me. Debbie Joensen is the wife of the ship's first officer, Jonhard Joensen. She is from Maine and has a lovely smile. She is a counsellor on the shipâ€™s ward and works wonderfully with the patients - always touching them playfully, always flashing a winning smile around them. Usually a bundle of nervous energy, today in the hospital she is still and tense, holding back tears, gripping Clinton's small leg, eyes closed in prayer. The other woman, Ann Giles, is an experienced nurse from Britain. 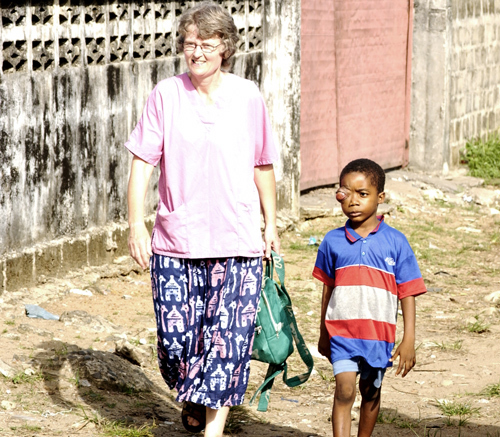 She began working with Mercy Ships palliative care in 1997 in Guinea. For healthy young types like me who might not know what that word means, the World Health Organization (WHO) defines palliative care as "the active total care of patients whose disease is not responsive to curative treatment. Control of pain, of other symptoms, and of psychological, social and spiritual problems is paramount." But to live until you die." This is what Ann's work is all about. She and her husband, Tony, a maxillo-facial surgeon, are Mercy Ships "regulars" - flying in from England for 6 - 8 weeks each outreach. She has seen many things over the years and is able to diagnose a variety of West African maladies. As she says, "You just don't realize how much you know until you realize you know things other people don't." Ann has had experience with Burkitt's before, although it's a sad story. 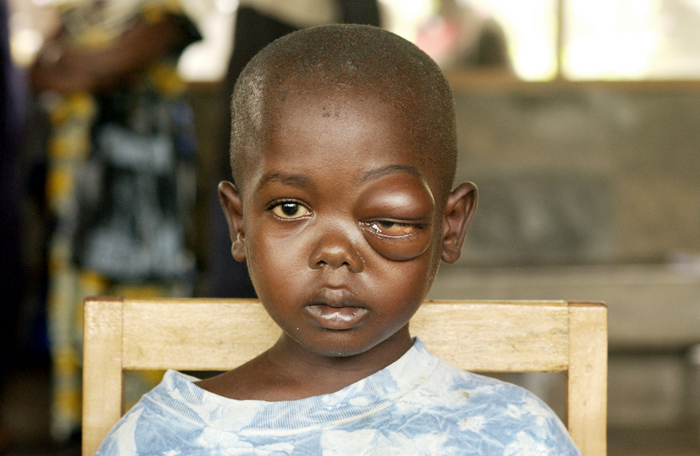 In 2003, working with palliative care, it was discovered that the patient, Shaku, a young boy with a bulging eye rivaling Clinton's or Korle's, had treatable Burkitt's. She and Tony found the drugs to treat him, and the eye began to respond to treatment. They admitted him to a local hospital where he suddenly developed tuberculosis. They returned with medicine to treat the TB, only to find he had contracted malaria and died. Ann tells me they had been giving Shaku's mother money to feed him, to keep him strong. The day after he died, the boyâ€™s mother approached Tony and confessed instead to having spent it on herself. Ann said she learned a valuable lesson that day about how things work in this difficult land. She says plainly, "In Africa you use the resources for the living, not the dying." The lesson learned is an age-old one. If you want something done right, you do it yourself. And so we sit in the waiting room with the two boys, making sure they see the doctor. Making sure they are admitted. Making sure they receive the chemotherapy. Making sure they get their chance to live. Dr. Sherif Seguiny's door opens, the last at the end of the corridor attached to the waiting room. We step past 15 or so children waiting to see him, many crying. Dr. Sherif is a pediatrician from Egypt. "On loan" from his ministry of foreign affairs, as he puts it. He has been here 9 months and seen 10 Burkitt's cases in that time. "If we get it early, they improve with treatment" he says. We find out during his questioning that Clinton had been to see him before. His mother brought him in for one session of chemotherapy and when the eye began to respond to the drugs, didn't bother bringing him back for the essential five remaining treatments. Perhaps not dissimilar to a bout of bronchitis I once had that cleared up a day or two after I began taking antibiotics. Perhaps not dissimilar to me seeing no point in finishing the extended round of antibiotics until the mucous came raging back worse than when it began. Yet this cancer will kill him and he is but a child who cannot make decisions himself. As Clintonâ€™s mother looks to the doctor with earnest hope, I check my anger towards her. Clinton is now here with us, safe with us. Dr. Sherif says he'll "over" hydrate both boys today, and then drain a bag of liquid cyclophosphomide into their arms tomorrow. We'll pick them up and drive them home on Wednesday, and then as Ann's off to the U.K. it will be my job to make sure they both return in exactly 21 days for a repeat performance. Six repeat performances at the end of which they will either be cured or dead. I quickly try to establish a rapport with Dr. Sherif, discussing a patient of his I photographed at screening and believe we're operating on. We exchange email addresses. We'll arrange for a tour of the ship next weekend in exchange for his special attention to these children. He is upbeat and hopeful. He tells me simply and firmly that if I don't bring them back, they will not come back. Even though we are paying for their potentially life-saving treatment, they will not return. I promise to make sure they do, and we head down the hallway to admit them. General consensus gives Clinton and Korle a 50/50 shot at life. If the cancer has not already developed too far, their small bodies will respond to six rounds of completed chemotherapy, and they will look as normal as the next child. Their eyes will shrink and become symmetrical, and they will bear no scars. They will draw no more looks; they will join the ranks of the healthy. We pay the $6 to admit the boys to the hospital, the eighty cents for their hydration IV packs, and tell them we'll be back on Wednesday, shrinking into the African heat. Your work in invaluable and you are making a lasting difference in the lives that you and the staff of Mercy Ships touch. Please continue your compassionate work of mercy. We really can make a difference, as you know, one by one. Thank you for using your God-given gifts of journalism and photography to bring the reality of the world to the attention of myself and others who would weep if we really fully grasped the plight of the impoverish around the world. It is always good to read your posts. I am so thankful for your work and your service. We are praying for you and those you serve. Scott- I also want to thank you for this ministry of opening our eyes to the needs of those suffering in West Africa.Our daughter has the privilege of participating in the current Segue program in Liberia.It is hard to find words to describe all the changes that have come to our hearts.Mine seemed to break and then be filled with a new hunger to see as Christ sees and love with his love and to praise Him for this work He is doing. Reading your postings is like reading stories I cannot put down without finishing first. May God continue to grow you, lead you and bless you as you are a part of blessing the lives of so many in need. Always look to Him and remember to praise Him for His steadfast love and provision. Thank you for sharing your life with others and leaving a legacy. As Americans we are so blessed. Praise the Lord!! That is so sad. Only photographs will bring it to the world. Thanks. So what happened to these two young boys?